Rory has won two in a row. HE WAS NO 1 IN ALL BUT NAME before the start but as Tiger Woods limped away with a recurrence of his back injury to vacate the throne, Rory McIlroy hit Sergio Garcia with four thunderous blows in the first five holes and officially claimed the crown as he became only the second player since Woods to win a major and a World Golf Championship back-to-back when he claimed the Bridgestone Invitational by two strokes at Firestone on 15 under par. The Open champion's closing 66 was as impressive as it was expected--massively long, arrow-straight driving and towering irons on a soft golf course--as he overturned a three stroke deficit with respect to Garcia (71) thanks to a vicious opening flurry of blows you'd expect from Marvin Hagler in his prime. Four birdies in his five holes put him two clear and while Garcia drew level with nine to go when McIlroy bogeyed the eighth and he birdied the ninth, he fell one behind again when McIlroy birdied the 11th and then lost the title with a pulled tee shot leading to a fatal bogey at the par-three 16th. European Ryder Cup skipper Paul McGinley watched this driving exhibition in awe from a Sky Sports studio and described McIlroy's driving all week as the best performance he had ever seen. The 25-year old lives and dies by that club and in averaging 334 yards off the tee, making him longer than anyone in golf including Bubba Watson. McIlroy destroyed Garcia by hitting nine of 14 fairways and then peppering the pins. Five shots behind Garcia with three holes to play on Saturday night, McIlroy found himself one clear of the Spaniard after just three holes of the final round and two ahead after five before easing off the gas. 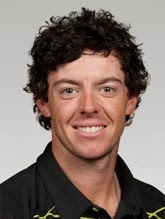 "Yeah that was a huge stretch of the golf tournament," McIlroy said of his birdie-birde-birdie-par-birdie start. To birdie the last two last night and then they way I started today--four under through the first five--I just started really, really well and put some pressure on Sergio early." Asked about the importance of his driving, McIlroy added: "I've said it all week. That's the foundation of my game. When I drive it like that I've a pretty good chance to win most week and I've showed that the last couple of weeks and hopefully I'll go to Valhalla in good form and trying to get three in a row."